On Father’s Day 2015 at the George R Brown, The Consul General (CG) of India Harish Parvathaneni and Congressman Al Green spoke to the crowd with energized inspiration about the future of human wellness across a crowded room of over 2500 people gathered in honor to inaugurate the International Day of Yoga recognizing yoga as a practice toward peace and harmony. Over 3,500 Houstonians and over 100 wonderful volunteers signed up to join Sunday’s event, which was celebrated in cities around the world with 177 United Nations joining the Prime Minister of India to honor peace and harmony annually on this chosen day. Included at the event was a wonderful ceremony honoring India, The United States and community leaders followed by meditation, yoga demonstrations and lectures about yoga’s therapeutic and conscious benefits. 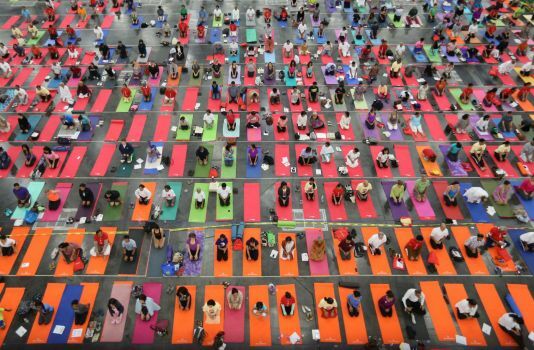 Houston has become a mecca for yogic practices and the overall vision for humanity. The event was congratulated and supported by state officials and diplomats, and also by the Chancellor and President of the University of Houston Renu Khator. Khator said, “I do yoga every day.” She has been a long time advocate of yoga since her youth living in India. She practiced yoga up front on the second row near the Consul General of India and his lovely wife. The world is seemingly ready for an integration of mind/body/planet health like never before. We have reached a new age where wellness is recognized as more than just exercise and diet. Health is a complete system that combines the physical, mental, emotional, spiritual and planetary components of being. Regardless of race or religion, we are one human race that must balance with the each other and the planet. We have reached the tipping point where our conscious actions are crucial and influence a world of concerns from climate and environmental contamination to human faction and war. It’s time to remember oneness for all. Perhaps looking outward for solutions is not the way to find truth, wellness and integration. Also famously quoted is Mahatma Gandhi who said, “You must be the change you wish to see in the world.” Innately it suggests traveling inward, and that is exactly what mindfulness and yoga invite us to experience. If we change, the world around us can also transform into a place of peace and harmony. This is an invitation from the International Day of Yoga to join us again each year and help us beat our record of 3500 registrants to be the change. Namaskar.